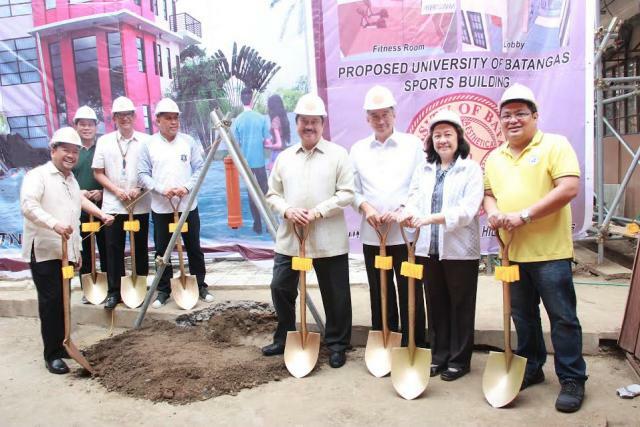 University of Batangas ushered in the construction of its new Sports Building with a groundbreaking ceremony last February 13, 2017. On hand to lower the symbolic time capsule to the ground were Dr. Hernando B. Perez (University President) and Atty. Jesus V. Mayo (Chairman, Board of Regents and Vice President for Student and External Affairs). Gracing this important milestone were Mr. Alex A. Ramos (Vice President for Administration), Mrs. Maria Cecilia Q. Verceles (Director, Management of Assets and General Services), Mr. Christopher Quizon (Sports Development Director), Mr. Luis Bautro, Engr. Larry Soriano and Architect Allan Kenneth Tolentino of MAPT Trading and Construction, the man behind the modernist design of the new Sports Building. The project will initially house a two-storey building that will include Female and Male quarters for the athletes, Bathrooms for Male and Female, Sports Office and Fitness Room. “Innovative design pero nandun pa rin yung character ng UB”, shared Architect Tolentino. Expected turn-over of the building will be by May 2017.